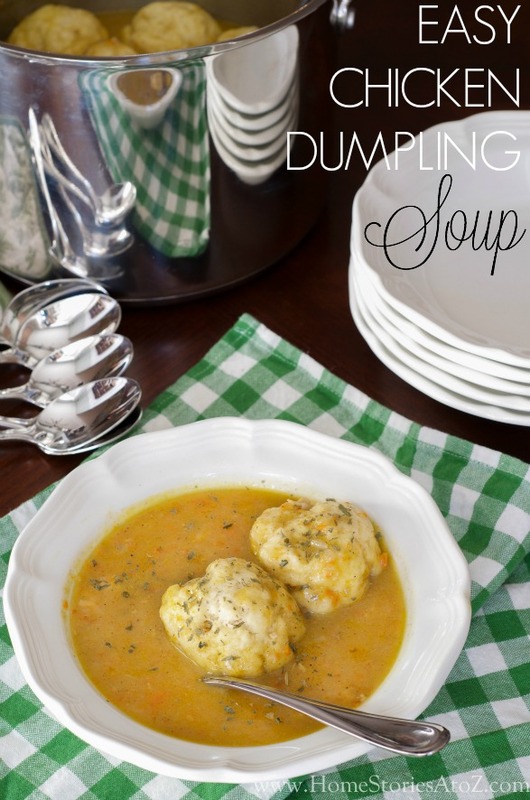 I affectionately refer to this recipe as A Hug for Your Mouth, aka Chicken Dumpling Soup. This recipe is a treasured family heirloom, and I’m entrusting it to you today, so use it wisely. 😉 I pass it on to you in gratitude of all the virtual hugs and encouragement you have given to me over the years. May it comfort you and yours in 2015 and many more years to come! Is that too much? Too dramatic for a soup recipe? Well, make it and taste it for yourself and you’ll see what I’m talking about! There is a reason certain foods are called comfort foods and this one is right up there with ice cream and mashed potatoes for me. My mom started making this soup for us when we were little, after a trip to Colonial Williamsburg-where the recipe originates from. When I was sick and not feeling well, this is the “chicken soup” I requested. When I would come in from a long day of childhood sledding in Michigan, this is the soup that warmed me back up. When I was dealing with a heartbreak, this was the soup that dried some of my tears. Consider it comfort and a hug for your mouth! While I love this soup, the original recipe which is from a Colonial Williamsburg recipe cookbook is more laborious than I have time for most days. My modified recipe tastes just as good as the original but can be made in half the time. Also, I should note that these dumplings are biscuits and not the noodly kinds of dumplings in some chicken and dumpling soup recipes. I like these MUCH more than the noodly things, but just in case you are expecting noodles, this recipe won’t produce them. Now let’s get cooking! Step 1: (Optional) Brown your chicken breasts. This step isn’t completely necessary, but it will add to the flavor of your meat since essentially you are boiling the chicken which isn’t as tasty. When browning, you aren’t worrying about cooking the chicken all the way through, just searing the outside of the meat. Place some oil in a dutch oven (or soup pan) over medium high heat and brown your defrosted chicken breasts. Step 2: Add chopped vegetables and spices. Add your chopped carrots, celery, and onion to the pot. Tip: I use our Ninja Blender with just the smoothie cups attached to chop the veggies. I’ll pulverize about three celery stalks and then chop one stalk by hand. I’m not a huge fan of the taste of bits of cooked celery so choose to liquify most of the celery. The carrots chop perfectly in the Ninja and the onion does better if you quarter it first. Add your garlic, pepper, and salt to the pot. Step 3: Add 1 quart of water to pot, cover, bring to boil and simmer for 20 minutes. Step 4: Remove cooked chicken breasts from pot and coarsely chop, cube, or shred chicken. I use tongs to fish my cooked chicken from the pot, place them on a cutting board, and use kitchen scissors to chop the chicken. I prefer my chicken to be in cubes, but if you like a more shredded texture in your soup feel free to cut it up however you see fit. Step 5: Add chopped chicken and chicken broth to pot. Place the chopped chicken back into the pot and add 1 quart (32 ounces) of chicken broth to pot. Cover and bring back to a simmer. Step 6: Make a roux. Don’t let the French word scare you. It sounds fancy and pretentious but is totally easy to do. A roux (pronounced roo, like the sweet character in The Hunger Games. Oh sweet Roo!) is a mixture of butter and flour that creates a thickening agent for soups and sauces. Mix your 4 T flour and 1 t paprika in a bowl. Melt 4 T butter over medium heat. Lower the heat to low and add the flour and paprika mixture to your pan. I actually hold the pan up off of the heat with my left hand and mix briskly with my right until there are no lumps and the mixture is thoroughly combined. Stir continually over low heat for about 3 minutes and then add the roux mixture to your soup pot and stir until combined. In a bowl mix 2 1/4 cups Bisquick mix with 2/3 cups of milk. Count to ten slowly while you mix to ensure you aren’t over-mixing your ingredients. Over-mixing can lead to tough dumplings. The dough should be combined but might look crumbly which is okay. Roll in your hands golf-ball sized balls of biscuit dough and place dough balls onto a plate. Add all the dumplings at once to your pot so they cook evenly. Cover pot and simmer for 15 minutes and don’t lift the lid! Step 8: Stir in half and half and enjoy!! After your 15 minute dumpling timer is up, simply add 1/2 cup of half and half to the pot, stir until combined, and then serve your soup. You can garnish with parsley if desired. In a dutch oven or soup pot, brown chicken breastsi n a few tablespoons of oil over medium high heat. After browning, add chopped onion, carrots, celery, garlic, salt, and pepper. Add 1 quart of water to pot. Place lid on pot. Bring to a boil, then reduce heat and simmer for 20 minutes. After 20 minutes, remove chicken, chop, and place back into pot. Add 1 quart chicken broth to pot, cover, and bring back to a simmer. Make roux: Over med-low heat, melt 4 T butter, and add 4 T flour & paprika to pan. Quickly stir out all lumps with whisk. Continue whisking for 3 min. Pour roux into pot stir to combine. Dumplings: In a bowl mix 2 1/2 cups Bisquick mix with 2/3 cup milk. 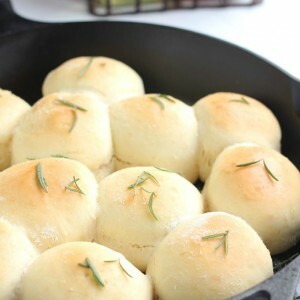 Roll into golf-ball sized dough balls and place on plate. 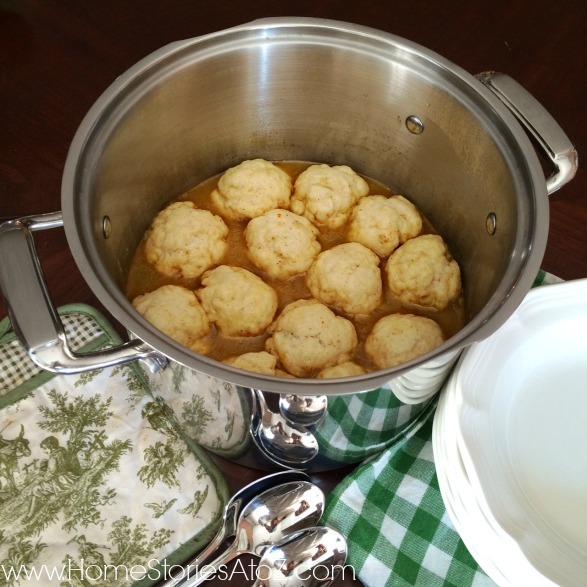 Add all dumpling dough balls to your pot at once. Immediately cover pot and simmer on medium-low for 15 minutes. DO NOT LIFT LID! After 15 minutes, remove from heat, and stir in 1/2 cup of half & half. This recipe serves 6. Serve in bowls, garnish with dried parsley if desired, and enjoy! My husband and I made this for our date night dinner tonight and it turned out AMAZING. I wish I could post a picture of the perfect dumplings all clustered together in the pot. We’ll definitely make this again. Thanks Beth for sharing your family recipe! 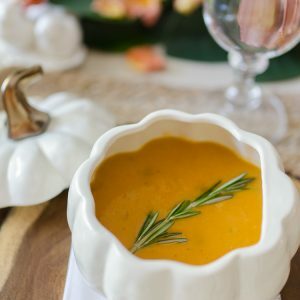 Just made this soup today …everyone loved it….im always looking for easy flavorful recipes , thx for sharing this one is a keeper. I didnt have half n half subtituted with evaporated milk. Gracias!! Ha! I love it. 🙂 We have some bowl lickers over here as well and if there happen to be leftovers there is usually a fight for them. So glad to hear your family enjoyed it! This sounds yummy and and I have been wanting some Chicken and Dumplings but did not know how to make them so I can not wait to try this out. Love family recipes! All the love in them make them especially good! Thanks! I will try this soon! 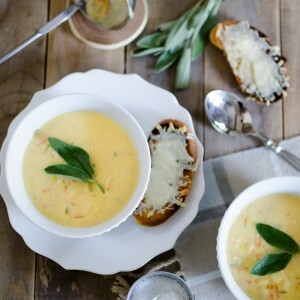 I love soup and this sounds perfect for a cold winter day. Thank you. I know, right? I hesitated sharing because seriously it’s like sharing the family jewels. I think this version is almost as good as mom’s, but the original recipe is better (and healthier) because you are basically creating bone broth for the recipe first with using a stewing chicken. Sometimes I’ll do the old recipe in a slow cooker to make the chicken broth if I have the time but using boneless breasts is much quicker. Sounds like a perfectly delicious meal for a cold Winter day! I am pinning this to my soup board right away! 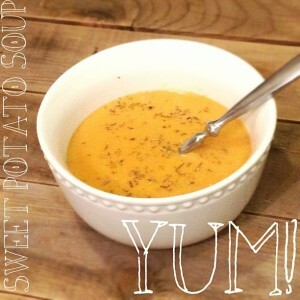 Also heading over to share on G+, it is time for hot soup! Oh, this sounds absolutely fabulous. Thanks for the recipe, I will definitely make some. I hope you like it Marty!